In the first week of January, we got our first look at the Xiaomi foldable phone, thanks to a video posted by Evan Blass on Twitter. At that time, it was not confirmed whether the company was working on such a device or not but today, the President of Xiaomi, Lin Bin, officially confirmed that the company is indeed working on a foldable phone. Also, he posted a video on Weibo showing the early prototype of this Foldable phone in action. As the video shows, the Xiaomi foldable phone has no crease or a hinge in the middle of the screen like on the Samsung’s foldable phone that the company showcased last year at the SDC. The screen folds from the left and the right side, leaving the rest of the display in between that can be then used as a normal smartphone. 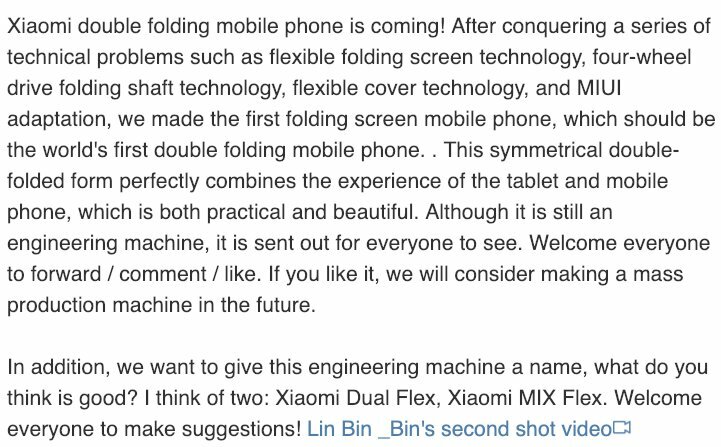 Xiaomi also claims that this should be the world’s first dual folding phone. Lin Bin said that the company faced some technical difficulties like getting a flexible display technology and also the MIUI adaptation to the changing screen size. The device shown in the video is just an early prototype but as per the President, the mass production will start in the future. The name is not yet finalized, but there are two names from which the company will choose one – Xiaomi MIX Flex and Xiaomi Dual FLEX. Which name do you think sounds perfect for the Xiaomi Foldable phone? Do let us know via the comment section below.